These mechanic length drill bits are made of special hi-molybdenum tool steel. They have a 135° split point to stop the drill from walking. To eliminate drill slippage, there are 3 flats on the shank. 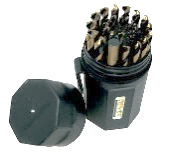 These drill bits are heat treated to 2185°F and are nitro-carburized to reduce friction, for a longer life. Self-starting point eliminates starter holes or punctures, even on curved surfaces. They have a double-fluted design for balanced cuts and cooler operation. 1" long shafts and titanium coating. Size Number of Size Shank Step Pkg. Range Hole Sizes Increments Diameter Thickness Qty.